One of the recurring themes in my discussions with motherboard manufacturers over the past several years is one of introducing differentiation to products and through that, new form factors. 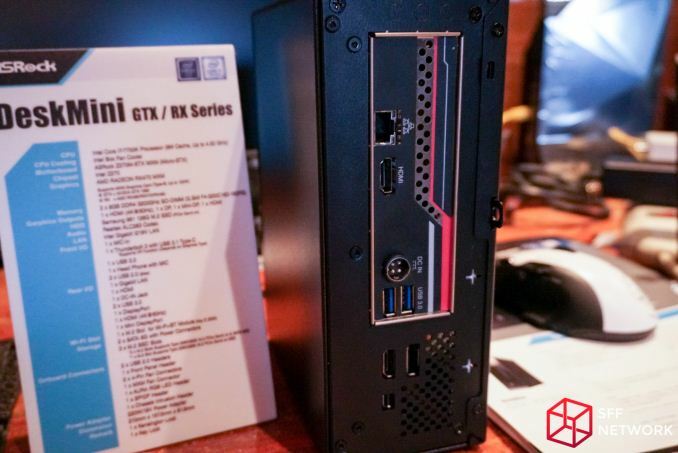 When mini-STX was shown by Intel last year as a different form factor focusing just on the processor rather than PCIe lanes, we saw the launch of several small-sized PCs, mainly for embedded functions, that could leverage a full desktop-class CPU and socket. 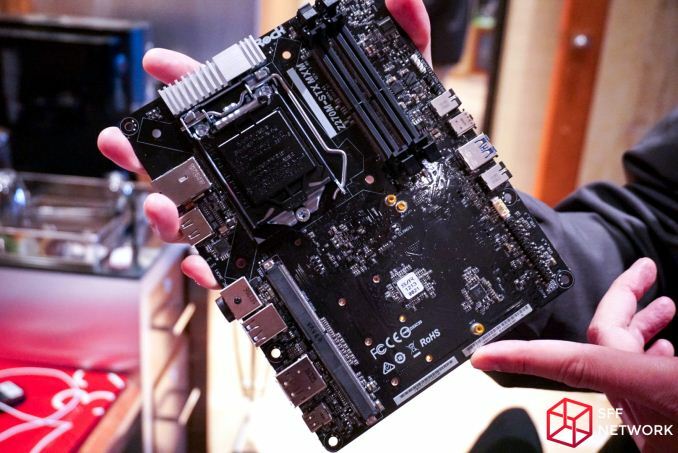 As always with CPU-only products, some users request a little more graphics oomph, so insert ASRock’s new ‘micro-STX’ type of motherboard and mini-PC that uses MXM-type graphics. Unfortunately our trip to ASRock at CES was curtailed due to other meetings overrunning, but it was interesting to note that ASRock was at the show formally with a suite, rather than just casually taking coffee meetings the previous two years that I had been. So all our pictures in this piece are from the Small Form Factor Network, and many thanks to them. 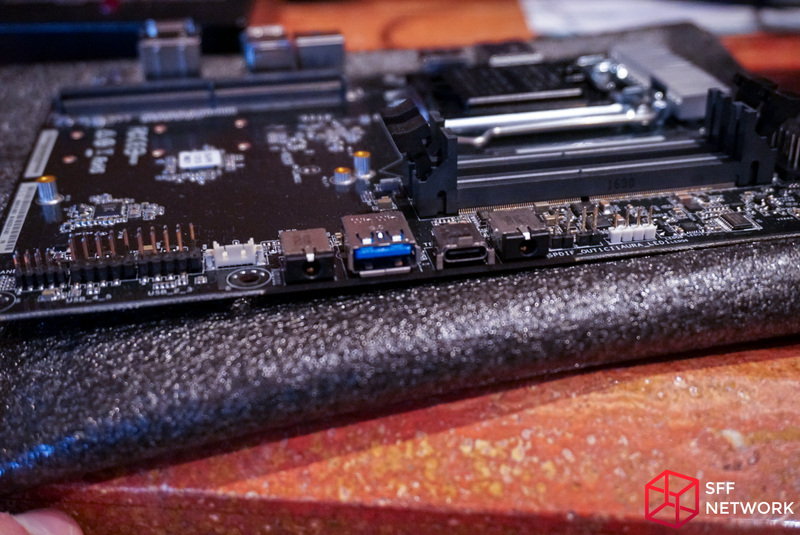 The mini-STX form factor is based around a 5-inch by 5-inch motherboard design, which gets you enough space for a socket, some memory and some IO. With this micro-STX motherboard, ASRock is clearly going at length to support more: the MXM module bay takes up the whole second half of the motherboard, and one key thing to note here is the socket area. On the left-hand side, where we would normally expect to see the IO, we have Intel’s recommended socket area marked. 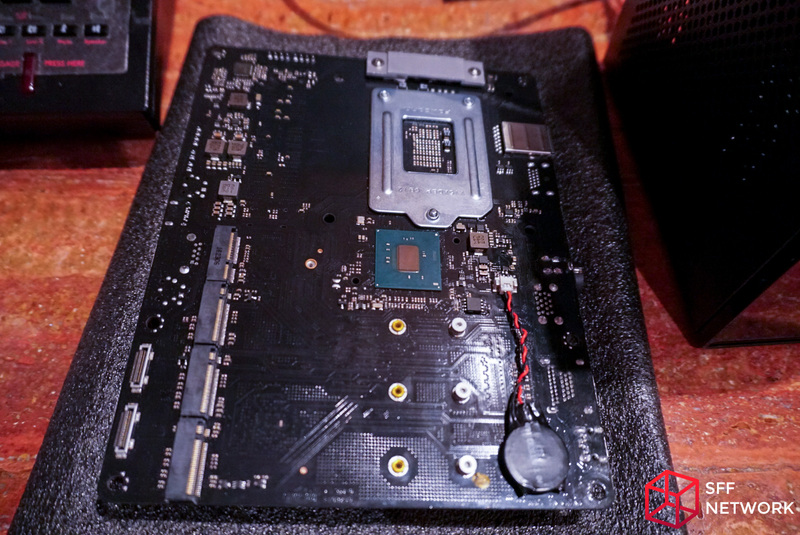 Normally this is left near-blank to account for coolers and such, but ASRock as engineered the rear IO right up to the socket itself, and using low profile IO ports to allow a cooler to fit. Because of the way mini-STX platforms work with few power phases, these are solely above the socket as not to interfere with to the left of the socket. On the front side of the board, the chipset is nowhere to be found. That’s because it is on the back, along with the CR2032 battery and three M.2 ports. 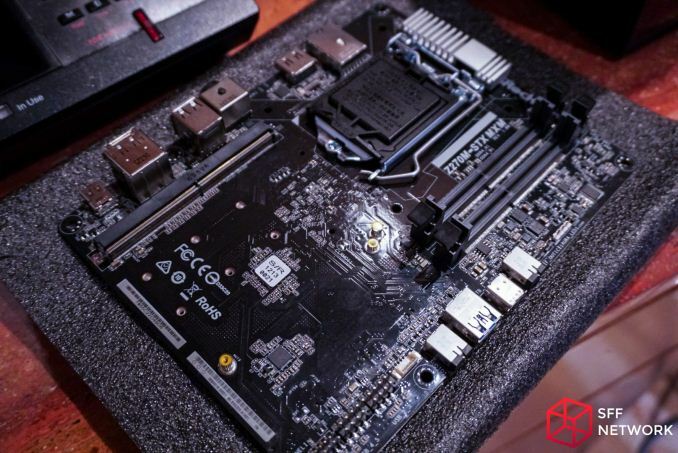 Because of the chipset support, all three are PCIe 3.0 x4 capable, with spacing for 2260 and 2280 sized M.2 ports. For good measure, there’s also an M.2 WiFi port. Front functionality comes through a USB 3.0 Type-A, a USB 3.0 Type-C (ASRock in their sign claim this is USB 3.1 and Thunderbolt 3, however I cannot see an ASMedia ASM1142/ASM2142 nor an Alpine Ridge controller for this), and two audio jacks from the Realtek ALC283. The front uses an Intel I219-V gigabit Ethernet controller, two USB 3.0 ports, an HDMI port, HDMI 2.0 port (via MCDP2000), a DisplayPort adaptor, a mini-DP port, and a DC-In jack. It’s worth noting that the specifications list also has two SATA ports on the description, but like the TB3 controller, I can’t see them on the pictures, front or rear. 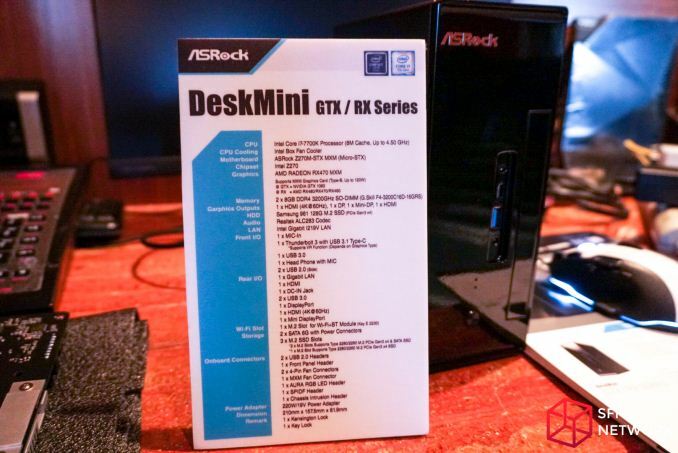 As a system, the 2.7-liter DeskMini GTX/RX will feature a Core i7-7700K using an Intel stock cooler (so don’t expect much in the way of overclocking), support for up to 16GB of DDR4-3200 SODIMM (not sure why it’s not 32GB, perhaps z-height? ), a 128GB Samsung 961 M.2 SSD, and an MXM Type-B graphics card: either a GTX 1060 for the GTX model, or an AMD RX card for the RX version. The PSU is rated at 220W, which can limit options. Personally, I’d prefer a solid copper cooler on there for a Core i7, but a Core i5/i3 would do OK with the stock cooler. Prices and release date are unknown. MXM Allows for a full range of GPU choices (all the way to the GTX 1080). HHHL cards take up more space, and the biggest/best you can get there is either an RX 460 or a GTX 1050. That would be a far, far worse choice. The market for MXM just isn't here yet. And MXM cards were designed for severely z-height limited systems like laptops. Insisting on fitting that into a desktop with (relatively) plenty of head-room is a pointless exercise. And since MXM cards are designed with laptops in mind 99% of the time you'd be hard pressed to find one that's actually speced like a desktop card. Cooling limitations ensure that it will never behave like one even if it had the same specs. The sales for PCs are declining for years now and the segment for "really tiny but oh so powerful systems" is probably nowhere near the size needed to convince manufacturers to put out good and cheap MXM cards. So you're stuck with expensive modules that only run on some systems, that need custom cooling only useful in those particular systems and very limited upgrade options. 1) The R9 Nano uses HBM, which is how they got it that tiny. Are you saying SFF builds should be limited to HBM-equipped GPUs, or GPUs low-end enough to require very little space? That makes little sense to me. 2) Sure, MXM was designed for low Z-height. But it mainly was designed to take up less area than standard PCIe. Would it be possible to make "desktop only" MXM cards with slightly taller (and probably cheaper) power delivery components? Absolutely. And the "less area" thing is what matters here. Again, you can get a _fully specced_ GTX 1080 in MXM form - only limited by cooling. Sure, it won't OC as well as the desktop cards, but that really doesn't matter. 3) "99% of the time you'd be hard pressed to find one that's actually speced like a desktop card." No. The entire mobile GTX 10XX series is ~identical to their desktop counterparts, with minor optimizations for power savings. Heck, the 1070 has _more_ cores than the desktop version (albeit at lower clocks). Performance differences stem mainly from lack of proper cooling. Which would be a very solveable problem in a case like this. 1) The GTX 1080 is so good in mobile devices because it's a very efficient chip (performance per watt). Are you saying SFF builds should be limited to very efficient chips? Is this your argument? o_O How can limiting them to MXM boards sound better? MXM has virtually 0 availability for desktops right now and even for laptops it rarely met its purpose. How long do you think it will take for high end GPUs (GTX 1080 equivalent) to have HBM? How long before MXM becomes mainstream and affordable? 2) It's very possible to make a standard PCIe card much smaller. And that's exactly the point. Why work with yet another standard that's incompatible with almost everything in the desktop space right now? With PCIe you'll be able to move your tiny card in a full size PC should you want that. 3) Absolutely identical save for the lower clocks and the fact that TDP limitations will always force that chip to drop clocks even further when used in a thermally constrained environment (like a laptop or typical MXM cooling). Long story short there is no practical MXM implementation right now that can compete with a desktop card implementation because of its intrinsic limitations. 4) How many games are sold is irrelevant. I was talking about a discreet GPU market that becomes relatively small and then you go on and split it between two completely incompatible formats: PCIe and MXM. Every other format goes for universal standardization (at every layer) so why should graphic cards be an exception? Just for the sake of exotic hardware? 1) Yes. Or, well, I'm not arguing that they _should_ be, I'm simply pointing out that due to the laws of thermodynamics and/or current cooling technology, SFF builds _are_ limited to one of three things: low-power GPUs, very efficient GPUs, or some sort of water cooling implementation. I'd LOVE for my Fury X to fit in a tiny chassis (heck, I'm moving it into a custom loop in an ITX case some time this year). But it can't. Below a certain volume, displacing >250W of heat simply becomes impractical. 2) Sure. But that would drive costs up massively - after all, miniaturization is as much of a reason for the cost of MXM cards as scarcity. SFF costs more, and will always cost more. I for one am willing to pay somewhat of a premium for that. Also, MXM _is_ PCIe. Making a PCIe-to-MXM adapter in the case of proliferation of these cards would be no problem whatsoever. Gigabyte already has one in their BRIX UHD. This would make for _more_ standardization and interchangeability, not less - you could migrate the GPU from your laptop to your desktop, or vice versa. Upgrade either, or both. Keep, and reuse, a part that would previously go to waste. And so on. 3) Lower clocks? Only due to TDP limitations. Nvidia is quite flexible with this, but they don't want people to fry their laptops simply because they've heard that overclocking is cool af. In a case like this, with sufficient cooling, there's no reason for the board to deliver equivalent clocks to stock cards. Will the power delivery handle similar OCs to a full PCIe board? Probably not. But neither would the power delivery on your proposed tiny PCIe card. 4) Who mentioned games? I sure as f*ck didn't. Please read before you comment. I said gaming PCs. Gaming PC sales are _rising_. Sure, AIB GPU sales are droppiing off, because sales of low-end (think GT 730, Radeon R7 240) are tanking. Cards like that used to represent HUGE sales numbers (with near zero margins, but nvm), but are now being replaced by capable iGPUs. Sales of midrange and high-end GPUs are either stable or rising. Sales numbers for >$200 GPUs are massively up the last 5-10 years. And no, I'm not asking the wrong questions here. If anyone is, you are. I'm talking about _increasing_ compatiblity. MXM is currently irrelevant because the market for gaming laptops used to be tiny, and when laptop makers had to design the graphics card custom any way, they might as well integrate it onto the motherboard. This is no longer the case, although integration is still done to a large degree for the sake of miniaturization (as thin-and-light gaming laptops are very popular). Still, the popularization of good gaming laptops could quite easily reinvigorate the MXM standard. Also, of course, the MXM-SIG needs to step up its game. But, you might ask, how can MXM cards increase compatibility? That's pretty easy. -They can be adapted to PCIe with relatively simple, low-cost adapters (that can carry over between generations, unless you need new display outputs). As mentioned, see the Brix UHD. -They allow for standardized coolers. You keep arguing for compatibility, but ignore the fact that GPUs are a free-for-all when it comes to cooling solutions. I'd love to see you fit a high-end cooler from the previous generation to a current-gen card, even from the same maker. Not a chance. Want custom cooling? Great, you can replace that every upgrade too! The clusterf*ck that is GPU coolers would benefit greatly from standardized component placements. A market where GPU coolers can be chosen like CPU coolers can is a market I welcome with open arms. And yes, this can of course be done with standard PCIe cards. But there's no incentive to do so, as added components (bigger power delivery and such) is considered a value-add, and standardized component placements could jeopordize this. In the SFF space, the incentive is there, as there's limited room for huge coolers, and fitting the cooler to the case is a more pressing issue. -They increase interchangeability. A single card could feasibly fit both laptops, SFF PCs and regular desktop PCs. Also, the PCIe form factor standard places pretty severe limitations on how small you can make cards. -IO slot sizes are standardized, and not optional. You're stuck with either HH slots or FH slots, and both have bulky and awkward form factors and mounting mechanisms for SFF. This isn't surprising, since this aspect of the standard is made to be compatible with AGP, PCI, ISA (and so on) slots, with dimensions worked out in the 80s and early 90s meant for servers and full-tower desktops. -PCIe power delivery is big and clunky, and has no place in SFF PCs. Of course, power connectors are adaptable. But for SFF use, a smaller standard (with higher quality requirements to make up for a smaller connector) is pretty much necessary. And the answer to your last question is: Because the one we have is reaching its limits in a number of significant ways*. This _should_ prompt a re-think. But then again, dumb people kept using Windows XP for more than a decade. I guess you can't beat'em all. In tomorrow's feature: microMXM for USFF, EMXM for larger but not so large builds. Also microSODIMM, microATX power connector, micro USB headers, micro M.2 slot, micro screw holes, and why not... micro CPU socket. Some of there require almost 0 re-engineering so maybe breaking compatibility is a small price to pay to get a slightly smaller footprint. And I'm sure you could easily just buy some adapters to make these compatible with everything else. I mean why would it make sense to do this with GPUs but no other component? P.S. Yeah, not a completely new hardware ecosystem... just one that barely registers on any radar even in the laptop market let alone the desktop market where I think it exists exclusively in a handful of OEM builds.